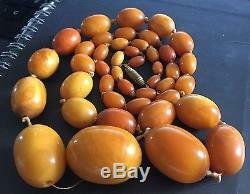 ANTIQUE AND VINTAGE 1920S ART DECO AMBER BEAD NECKLACE. 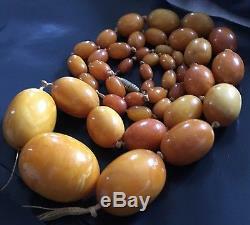 LONG AND LARGE BEADS WEIGHING 64.2 GRAMS AND 30.5 INS TOTAL LENGTH. 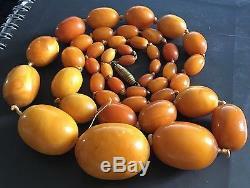 LARGEST BEAD MEASURES 1.2 INS LONG. 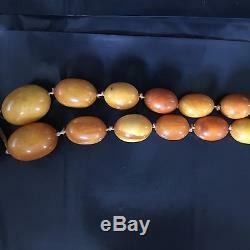 This superb natural amber graduated bead necklace measures 30.6 ins long in total when undone and consist 43 beads with the largest central bead measuring 1.2 ins / 3 cms long and the next two measuring 1 in long. This necklace has a total weight of 64.2 grams. 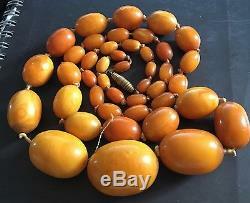 This necklace has been fully tested for amber and is genuinely amber. 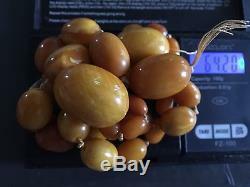 It has a wonderful amber butterscotch colour with strands of bright solid yellow - truly beautiful. It s excellent condition with a good colour and striation to the beads but does a few very small flea bite marks, chips but these are not bad and to be expected. However there is a small flea bite chip to the face of the largest bead - please see photos. 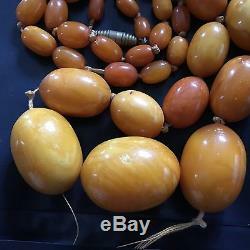 This top quality set of antique amber beads is a must for any neck but will need to be re- strung as the cotton has broken at the largest bead. 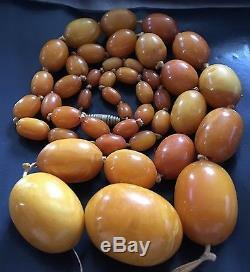 The item "GENUINE NATURAL BALTIC BUTTERSCOTCH EGG YOLK AMBER BEAD NECKLACE 64.2G ANTIQUE" is in sale since Friday, August 19, 2016. This item is in the category "Jewellery & Watches\Vintage & Antique Jewellery\Vintage Costume Jewellery\Art Deco (1915-1935)". 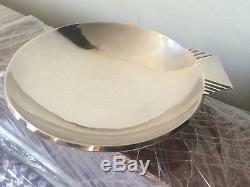 The seller is "busyboys101" and is located in HERTFORDSHIRE BUT WILL SHIP WORLDWIDE. This item can be shipped to United Kingdom, to Austria, to Belgium, BG, HR, CY, CZ, DK, FI, to France, to Germany, GR, HU, to Ireland, to Italy, LT, LU, MT, to Netherlands, PL, PT, RO, SK, SI, to Spain, SE, to Australia, to United States, RU, to Canada, to Japan, to New Zealand, to China, IL, to Hong Kong, NO, ID, MY, to Mexico, SG, KR, TH.